Since the CEP published its tainted and most controversial results for the presidential, second round legislative and local elections early last November, thousands have been demonstrated in the streets of Haiti’s largest cities to reclaim a recount of their votes. Religious leaders and international human rights and advocacy groups have also urged the CEP to investigate irregularities and massive electoral frauds that are no longer mere allegations. Photo Credit: CEP_Haiti Twitter Account. As protests widening, diplomatic talks failed and G8 candidates remaining steadfast in their position, to remedy the situation, Haiti’s PM Evans Paul in an one-page letter sent to the President Michel J. Martelly, proposed a formation of an electoral commission to ensure the credibility of the already festered electoral process. The commission according to the Prime Minister’s letter will have three days to produce recommendations to the government and the Conseil Electoral Provisoire (Electoral Provisional Council), known as the CEP. The head of the government stated,“ …it is necessary to organize credible, transparent, participative and inclusive elections,” as well as “to do whatever it takes” to create a climate of trust for the actors involving in the process. The CEP shows no sign that it will abide by the recommendations of the government-formed commission. One of its members Marie Carmelle Paul Austin told a radio in the Haiti’s capital that the electoral council members are ready to depart in bloc should the commission interfere in their work. “If this commission’s purpose is to redo or verify the work that the CEP has already done, the council members will resign,” implied council Austin. One thing Council Austin failed to admit is that the CEP could have avoided this electoral crisis and save the country from the upcoming political quagmire had it verified the alleged electoral frauds when one of its members brought it to the council’s attention. Instead of taking time to verify the alleged massive electoral frauds, the CEP’s negligent President Pierre-Louis Opont proceeded to the already contentious results. Now, it is the time to fix this mess. In 2010, the U.S. State Department and Haiti’s private sector elected Martelly in highly flawed presidential runoff with less than one million votes. When then President Rene Preval refused to accept the U.S.-OAS’s fabricated electoral results that demanded the removal of his handpicked candidate Jude Celestin. It was later reported that the U.S. and the rest of the international community threatened to depose him should he resist the OAS’s electoral commission’s recommendation. Today, nearly all the polarized figures, notably U.S. former ambassador to Haiti and current State Dep. Special Envoy to Haiti Kenneth Merten, who were involved in imposing a president to Haitian people, are part of the diplomatic negotiating team aiming at constraining the same Jude Celestin and other candidates to validate the CEP’s Opont infected results. It is important to point out that Merten is a closed friend to Martelly and one of the foreign diplomats who plotted the 2010-style electoral coup. By choosing Merten as his Haiti’s go-to person, President Barack Obama, once again, signals that there is no shift in U.S. policy towards Haiti. Meanwhile, Haitians have continued to remain vigilant against any possible flawed elections, and are ready to thwart another 2010-style electoral debacle. 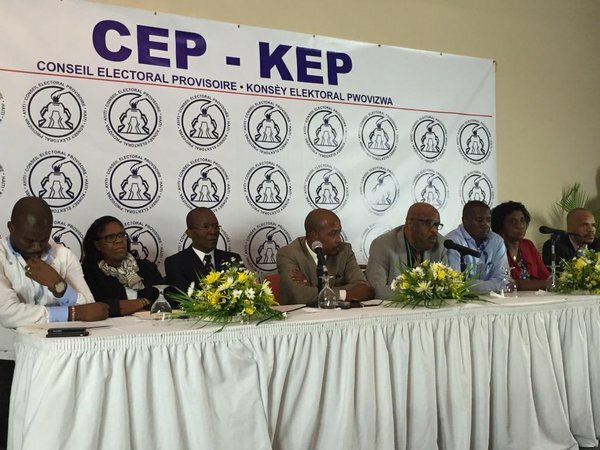 Within less than two months the CEP has to organize credible, fair and democratic elections for Haitian people to elect a new president to succeed Martelly. Under Haiti’s constitution, Martelly’s term ends on Feb. 7, 2016 and forbid to run for a consecutive term.